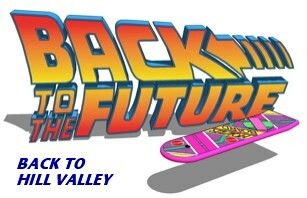 Welcome to www.backtohillvalley.com, one of the most original sites devoted to the Back to the Future trilogy. I try to translate this whole site into English, but it's gonna be long. The sections marked with (E) are in english. But you can still have a look at every section even if you don't speak French since there are maps and pictures on them. 04/10/2004 : New design ! >> A working courthouse clock ! >> VISIT HILL VALLEY 1955 ! Back to the Future : the old West !